When I first laid eyes on him, I swooned. His face. Those eyes. Oh boy, I was smitten. At first we spent all our time together. Cuddling. Saying sweet nothings. Watching movies late into the night, curled into one another. 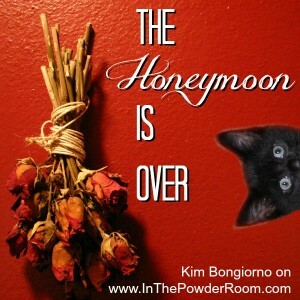 CLICK HERE to continue reading The Honeymoon’s Over on In The Powder Room, and let me know if you have been in the same predicament before. I could use some advice.